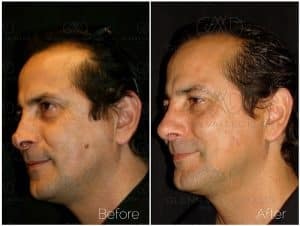 A rhinoplasty procedure, also known as a nose job, is a surgical procedure that can correct a number of cosmetic deformities related to the size, shape, and symmetry of the nose. Elements that can be addressed include the proportion of the nose to other facial features, the width of the nose at the bridge and tip, the appearance of the nose in profile, and the size and shape of the nostrils. Rhinoplasty may also be used to correct structural abnormalities that affect breathing. During the procedure, incisions are made within the nostrils and often along the edge of the nose. Tissue is lifted off of the nasal structure, allowing the surgeon to reshape the underlying cartilage and bone. Preparation: There are several things a patient should do to prepare for rhinoplasty. Blood-thinning medications, such as anti-inflammatory drugs and aspirin, should not be taken during the two weeks before surgery. If you smoke, you should quit for at least the two weeks before and after your procedure. Medical clearance by an independent physician is required for patients over the age of 45 before they may undergo surgery. On the day of your surgery, you should wear loose fitting clothing that buttons or zips up. Anesthesia: Most patients who undergo rhinoplasty will receive general anesthesia, though local anesthetic plus intravenous sedation may be appropriate in some cases. Rhinoplasty can be performed using either an open or closedprocedure. The procedures vary in the placement of the incisions. Dr. Vallecillos will discuss beforehand which option is best given your specific diagnosis and the extent of the surgery to be performed. In a closed rhinoplasty, incisions are made within the nostril. The soft tissues are raised, giving the surgeon access to the underlying structures. In an open rhinoplasty, incisions are made across the columella, the strip of tissue between the two nostrils. The soft tissues are raised and the underlying structures are addressed. Depending on the individual case, Dr. Vallecillos will either reduce or augment the underlying structure of the nose. In augmentation, a graft of cartilage from the septum, the ear, and rarely the rib will be used. At this point, Dr. Vallecillos can address any other cosmetic or functional abnormalities, the tissue and skin is re-draped over the nose, and the incisions are closed. Recovery time will vary for each individual. Patients should expect some pain and discomfort the first day after surgery. Anywhere from 5-7 days later, all packing and splinting will be removed. Stitches may be removed up to two weeks following surgery. Bruising in the eye area may take up to ten days to disappear, and it may be several weeks before the patient feels back to normal. Dr. Vallecillos will discuss your post-operative care with you before and after you undergo surgery. Are there risks or side effects with rhinoplasty? All types of surgery involve a certain amount of risk, such as bleeding, chance of infection, and possible reactions to anesthesia. You should expect some swelling, which may persist for several months after surgery. Though rare, additional risks may include changes in skin sensation, unfavorable scarring, and nasal septum perforation. The results of rhinoplasty should be long-lasting and patients should approach the surgery expecting a permanent change. However, if the cartilage continues to grow and reshape after surgery, results may change over time.